... and away we go! : Henry is 11 months!!! It is crazy to me that in one month's time I will have a one year old! I now completely understand why it is the youngest child's fate to be forever referred to as "the baby"! However, in looking through the pictures that we have taken so far this summer I can definitely see that our little bug is growing by leaps and bounds and looking more like a toddler all the time. Henry is not walking yet, but getting pretty brave about standing up by himself. He crawls around the house with such enthusiasm that his poor knees are swollen and bruised at all times. He still only has 6 teeth (which he has had for 5 months) but uses them to try lots of new foods. He has become much less patient with being spoon fed, grabbing and swatting at the spoon and squealing until we give in and let him have a bite of our sandwich, or pasta, or whatever is on the menu for the night. Henry is finally consistently sleeping through the night!! 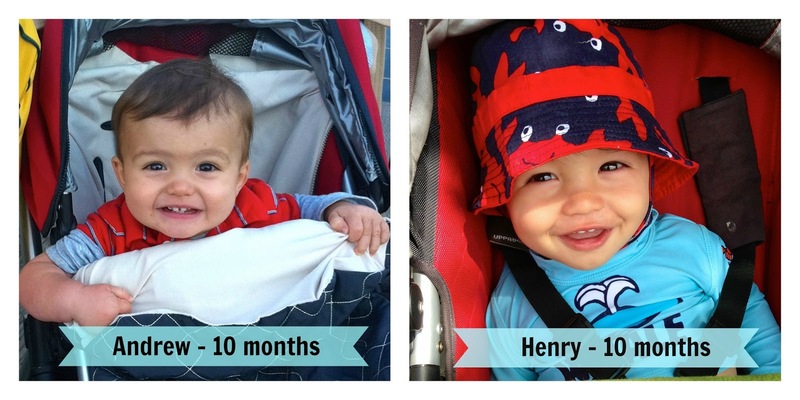 Last month I missed snapping a 10 month photo of Henry, but I do have this side by side comparison of him and Andrew, enjoying a ride in the stroller at 10 months of age. The similarities between the two are pretty obvious; their eyes and nose are practically identical, but their differences are what I find the most interesting. Andrew, from day 1 was referred to as "all boy" (a silly comment when you think about it). Henry, on the other hand, has much finer features and I have been asked on more than one occasion "how old my little girl is"! I guess he is kinda pretty! So, next month is the big 1 year celebration! Andrew and Henry's cousins, along with my Mom and sister, will be visiting us here in Baltimore. It wont be quite the event that Andrew's parties have been so far (we know nobody in this city!) but I can't wait to watch him smash a cake and be the centre of every ones world for the day! He's looking like such a little man.....can you tell him to slow down on the growing up please! I think it is his curls that confuses people and they mistake your little bug for a ladybug. He is adorable and all boy when him and Andrew play their funny chase games, love the giggles. Like you said, the youngest will always be referred to as "the baby" and you know all about that.